The new ACUVUE Advance for Astigmatism allows you to discover the world afresh and helps to protect your eyes from cataracts. ACUVUE Advance for Astigmatism contact lenses are the toric two-week lenses for astigmatism from the ACUVUE Advance family. The patented Hydraclear technology, created by the manufacturer Johnson & Johnson, guarantees unbeatable comfort for the wearer, even on long days. The innovative Accelerated Stabilisation Design (ASD) is a further highlight of the ACUVUE Advance for Astigmatism. It utilises the natural power of blinking to quickly position the contact lenses correctly upon the eye. With ACUVUE Advance for Astigmatism you can enjoy a permanently fresh and pleasant wearing experience, as the lenses are changed every two weeks - before deposits have the chance to form on the lenses. 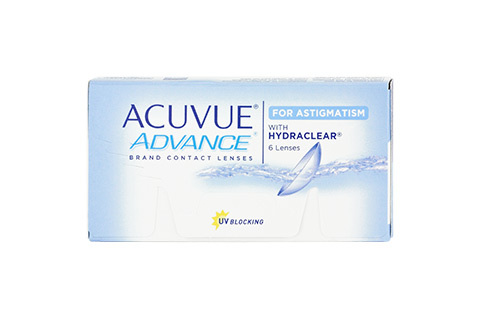 ACUVUE Advance for Astigmatism with ASD is a pleasantly soft, high quality contact lens, which is suitable for both beginners and for experienced contact lens wearers. The integrated UV protection in ACUVUE Advance for Astigmatism ensures your eyes optimal protection against the sun's rays. The practical 1-2-3 labelling system of ACUVUE Advance for Astigmatism contact lenses prevents you from puting the lenses in incorrectly. Don't forget to make the most of our bundle offers when ordering several packets of ACUVUE Advance for Astigmatism and the accompanying care solutions. Mister Spex advises all online purchasers of ACUVUE Advance for Astigmatism contact lenses: the contact lenses, ACUVUE Advance for Astigmatism, should always be fitted to your eyes by an eye doctor or optician. The period between fittings, unless otherwise prescribed by an eye doctor or optician, should not exceed 6 months. You should go for regular check-ups. You should also strictly follow the recommended wearing time from the manufacturer Johnson & Johnson/your eye doctor/optician for ACUVUE Advance for Astigmatism contact lenses. It is your own personal responsibility to make yourself aware of the care instructions for ACUVUE Advance for Astigmatism contact lenses and to follow them accordingly. In case of eye irritation or visual impairments when wearing ACUVUE Advance, consult an eye doctor or optician. Damaged contact lenses should be replaced immediately.